Traditionally you have to obtain Vietnam visa from Vietnam Embassy in your country before departure. However. there's another simple way to get Vietnam visa is obtaining Vietnam visa online and collect it at the airport on arrival in Vietnam. Newyouth Tourism. Co., Ltd is a travel agent services in Ho Chi Minh city, Vietnam. We are offering Vietnam visa on arrival for traveller to Vietnam. Vietnam Visa Online Service is available to avoid the lengthening visa procedures with their local Vietnam’s Embassies. 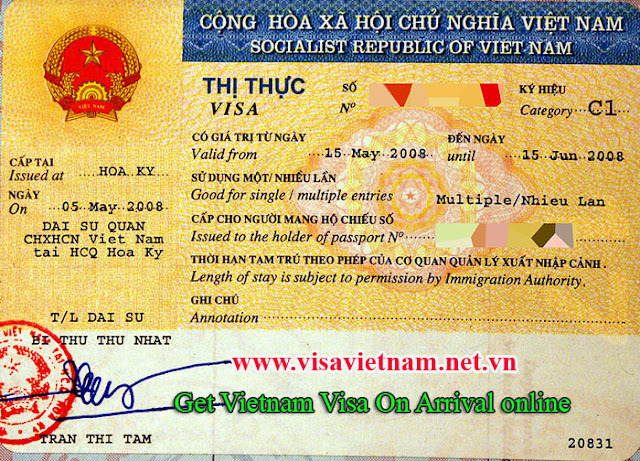 Offers the most secure, quickest and cost saving method to obtain Vietnam visa. We are licensed by Vietnam Government as International Tour Operator Company and Vietnam Visa Expert (License No. 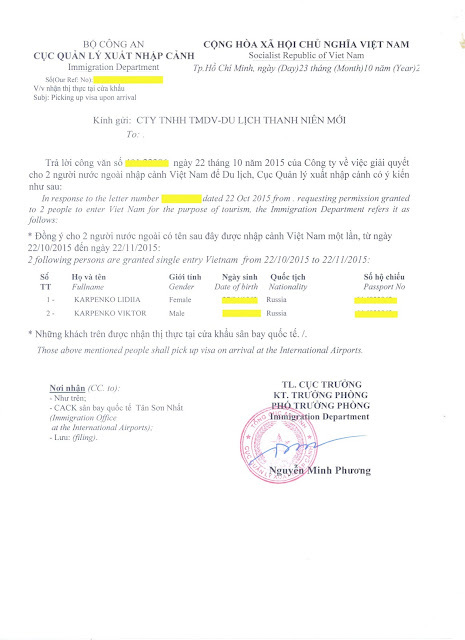 79-213/2015/TCDL-GPLHQT) who can organize tours for travelers all over Vietnam and apply visa for foreigners to Vietnam. And How to get a Vietnam visa on Arrival at Vietnam Airport? Step 1: Apply Vietnam Visa online at homepage. Visit E-visa Vietnam at “visavietnam.net.vn” fill online form. This online form use to obtain visa approval letter (from Vietnam Immigration Department) to pick up visa on arrival at Vietnam international airport. Please go ahead to fill online form as below if you entering Vietnam via airport and want to pick up your visa on arrival at international airport of Vietnam. Step 2: Make Online Payment. Confirm the information for processing your visa and pay the visa service fees. For visa on arrival (pick up visa at arrival airport / for traveling by air ONLY), you will receive a visa approval letter via email. - Urgent visa services from 2 to 8 working hours: contact us to hotline (+84) 988.512.577 (Viber,Zalo) or email: support@visavietnam.net.vn or thanhnienmoi@gmail.com for details and fees for the service. - Normal visa services from 1 to 2 days: please send mail to the address support@visavietnam.net.vn cause we can do for you soon. Based on the cost price. We will send Visa Approval letter to your email with code for picking up visa upon arrival at Vietnam Airport (Tan Son Nhat Airport in Ho Chi Minh city, Noi Bai Airport in Ha Noi city and Da Nang Airport in Da Nang city). After receiving Visa approval letter through email from us, print it out with 2 passport photos (4x6cm) and bring it along when you travel to Vietnam. Preparing at least 2 passport-size photos And Your Passport. You need to show the Visa Approval letter TWICE: To the airlines in your country when you check in and to the Immigration officer at the Vietnam's airport upon arrival to get the visa stamped onto your passport. You are then required to fill out the Application For Entry And Exit Visa, attach photos and pay the visa stamping fee (see the visa stamping fee) to directly the Immigration officer.